Si oblitus fuero tui, Ierusalem, oblivioni detur dextera mea. Jerusalem is where it all began. The site of Our Lord’s Passion, Death, and Resurrection and Ascension. The site of the Institution of the Most Holy Eucharist, the Mass, in the Upper Room. The site of the outpouring of the Holy Spirit on Pentecost and the birth of the Church. These events that fundamentally and forever changed the course of human history all happened here. Previously, through a long, glorious, and troubled history of a thousand years, the city had been the site of the Jewish cult of worship of the Most High on the Temple Mount. That cult was perfected through the Sacrifice of Jesus Christ on the Cross and transferred to the Catholic Church with the institution of the Sacrifice of the Mass, and is now performed throughout the world. The Church was born in Jerusalem but has never had it easy in the city of its birth. Its first martyrdom, that of Stephen, was suffered in Jerusalem only a few years after Our Lord’s Ascension. The first of the Ecumenical Councils was held in Jerusalem to decide whether or not the Mosaic Law was obligatory for Christians. For the first four decades of the Church’s existence, as she spread throughout the Mediterranean through the outpouring of the Spirit and the tireless work of the Apostles, she was constantly embroiled in conflict with the Jewish authorities in the city. Then in 66 AD the Jews revolted against their Roman overlords provoking a long and brutal war which culminated in the destruction of Jerusalem by the Roman general and future emperor Titus in the year 70. Following the destruction of the city the church rapidly diminished in both numbers and importance. The primacy of Rome was becoming firmly established following the martyrdom of St. Peter on the Vatican Hill just before the Jewish revolt. Following his defeat of the second Jewish revolt in 135 Jerusalem was rebuilt by the Roman Emperor Hadrian as the pagan settlement Aelia Capitolina. The small number of believers who remained went thoroughly underground at this point. They seemed to have retained a thorough memory of the sites associated Our Lord’s Passion, Death, and Resurrection since archaeological evidence has been discovered of foreign and Latin speaking pilgrims who visited the site now occupied by the Church of the Holy Sepulcher between the founding of Aelia Capitolina and the building of the basilica. After the Edict of Milan brought the Church out from underground in the Roman Empire the Emperor Constantine sent his mother St. Helena to Palestine to discover and commemorate the sites associated with the events of the life of Jesus Christ. Jerusalem would be a Christian city for the next three centuries. Basilicas and monasteries would arise to give memorial to the life of Our Lord and the apostles. Pilgrims flocked to the city from throughout the Empire even after the fall of the Western emperors. Jerusalem was a part of the Pentarchy along with Rome, Constantinople, Antioch, and Alexandria that were the great and most influential Sees of the Church and before the rise of Islam The city was sacked and briefly occupied by the Persians during the early part of the seventh century, but then regained by the Byzantine emperor Heraclius. The Feast of the Exaltation of the Holy Cross on September 14 celebrates in part the return of the relic of the True Cross, stolen by the Persians, to the city in the year 629. The return of the Byzantines was to be short-lived however. Within a decade Islam had stormed out of the Arabian desert and Syria, Palestine, Egypt, and Mesopotamia and the Muslims took the city of Jerusalem in 637. The Muslims stayed where the Persians had not, and the flow of Christian pilgrims flowed to a trickle. The conquests of Islam along the eastern and southern shores of the Mediterranean cast a veil between Rome and the holy city and there was little interaction between the two for the next half millennium. The emperors in Constantinople tried during that time, with varying degrees of success, to protect the holy sites and the pilgrim route to Jerusalem. The church once again diminished owing to the slow wearing away of the Faith and the general fall into apostasy of those who had been believers in all of the lands of the Levant now ruled by Muslims. Then came the launch of the First Crusade in the year 1095. Responding to a plea for help and the defense of Constantinople against the Turks from the Emperor Alexius Comnenus Pope Urban II called on the leaders of western Europe who sent forth a great army of men. Alarmed by the presence of this large (much larger than he had wanted) foreign army within his borders he sent them south away from Constantinople and to the amazement of everyone, except possibly themselves, they conquered first Antioch in 1098 and then Jerusalem in the summer of 1099. The brief Latin Kingdom of Jerusalem was then established which lasted less than a century before it fell to Salah ad-Din in 1187. Jerusalem then floundered for the next seven centuries, once again cut off from Rome and from Christendom. Local Christians remained but the city’s church fell into decay. The Franciscans were granted custody of the holy sites for the Latin Rite of the Catholic Church by virtue of St. Francis of Assisi’ positive encounter with the Egyptian Sultan Malik al-Kamil not long after the Muslims reclaimed the city, a custody which endures to this day. The Ottoman Empire conquered Jerusalem during the early 16th century and held it for the next four centuries. The city had shrunk down to a population of 60,000 by the onset of the First World War. The British Army took Jerusalem on December 8, 1917 and opened a new era in the city’s history. Christian pilgrims flocked back to the city for the first time since the Crusades, and new basilicas and monasteries were once again built where the ancient ones had fallen into ruin to commemorate the holy places but the British hold was short lived. The increase in Jewish immigration as a result of the Zionist ideology and the resulting conflict with the local Arabs made the situation untenable for the British after the carnage of the Second World War. They then left Palestine to the warring Jews and Arabs in 1948. The city was then divided into west and east between the new State of Israel and the Hashemite Kingdom of Jordan. The Israeli army conquered the eastern half of the city in 1967 and reunited it under Jewish control. The city of Jerusalem, owing to the enthusiasm of the Zionists for their ancient capital, is now more developed and a greater metropolis than it has ever been in its history but its Christian population is rapidly shrinking. The Christian population are mostly Arab Palestinians who are hostile to the Jewish masters of the city and therefore suffer from a want of favor among the local governing authorities and being caught somewhat in the middle of an increasingly fanatical Muslim-Jewish religious conflict. 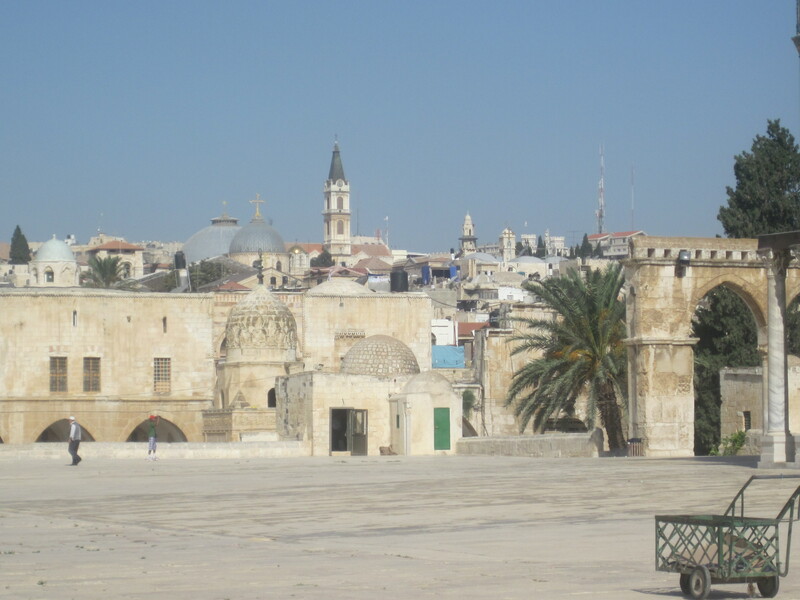 There are several Patriarchs of Jerusalem at present to serve the diminishing Christian population and protect the holy sites but they find themselves often in conflict with one another due to ancient theological and current political conflicts. The Armenians and the Greek Orthodox have a very strong presence in the holy city due to their historical proximity to the place. The Latin Patriarchate was lost after the failure of the Crusades but reinstated in 1847. The current Latin Patriarch of Jerusalem is Fouad Twal appointed in 2008. Do not forget Jerusalem. Offer the Glorious Mysteries of the Rosary on Wednesday for the See of Jerusalem, for its liberty and its salvation and the restoration of its ancient position as a pillar of the one, holy, catholic, and apostolic Church in communion with the See of Peter in Rome and for the conversion of the Jewish people and the conversion of the Muslim peoples. Pray that the birthplace of the Church will once again become a pillar of the Church.